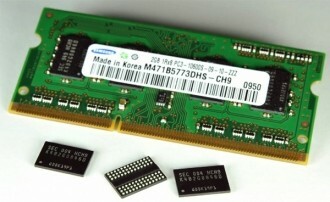 Information released by IHS iSuppli reveals that personal computers are no longer responsible for the majority demand of DRAM memory chips. In the second quarter, only 49 percent of all DRAM chips manufactured were used to build new PCs - the first time that PCs haven’t taken the majority share since the 1980s. The revelation further validates the trend we’re already seeing where tablets and smartphones are replacing traditional computers. Apple’s introduction of the iPad in 2010 led a market shift away from computers that has been heavily felt by manufacturers around the globe. Just last week, Intel lowered their third quarter revenue outlook partially due to consumer interest in tablets and other mobile devices. Experts at iSuppli believe the trend is irreversible at this point and will gradually decline over the next several quarters. By the end of 2013, computers will likely only account for 42.8 percent of all DRAM usage. Tablet share of the DRAM space, on the other hand, is expected to grow by four percentage points in the same time period. Despite the doom and gloom, the PC market isn’t going to vanish overnight or anytime soon for that matter but the shift in focus from computers to mobile devices could potentially slow DRAM innovation for PCs. Many are betting that Microsoft’s upcoming Windows 8 operating system will give the computer market a much-needed boost. Some executives and Wall Street analysts, however, aren’t as confident with such a forecast.